Enlistment records show that Rodney had one year of college and was a “semi-skilled” painter. When Rodney joined the Army, he was single and without dependents. Records say he was 6′7′’ in height and 124 pounds. I believe Rodney was initially buried in Europe. 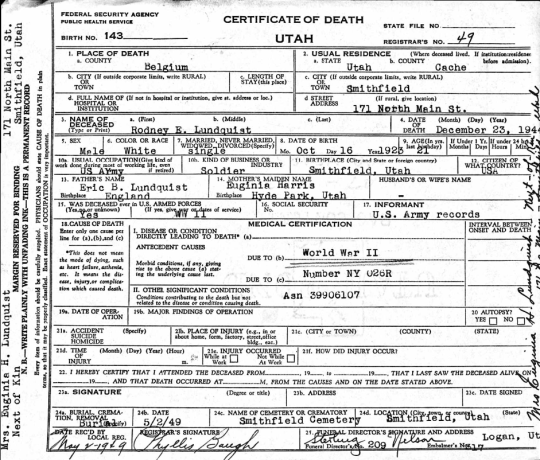 According to one record, Rodney’s body was returned “from ETO” to Utah on March 17, 1949 for reburial. “ETO” refers to the European Theater of Operations, which directed U.S. Army operations in parts of Europe from 1942 to 1945. The term “theater of operations” was defined in the U.S. Army field manuals as “the land and sea areas to be invaded or defended, including areas necessary for administrative activities incident to the military operations." Rodney was buried in April of 1949 in the Smithfield City Cemetery.